A couple weeks back, I found myself with an overabundance of Brussels sprouts. I’d asked Rick to pick some up at the store, so that I could make these Balsamic Roasted Brussels Sprouts with Cranberries as a side dish for a prime rib dinner that we were serving. My usual recipe for those sprouts calls for three pounds. I didn’t quite remember how many Brussels sprouts that actually is, and, we were only having a small party of four for dinner that night, so I ended up cutting the recipe in half. So… What do to with the remaining sprouts sitting the fridge? Test out some new recipes, of course! I’d wanted to try a shaved brussel sprout salad for a while, and this seemed like to perfect opportunity. 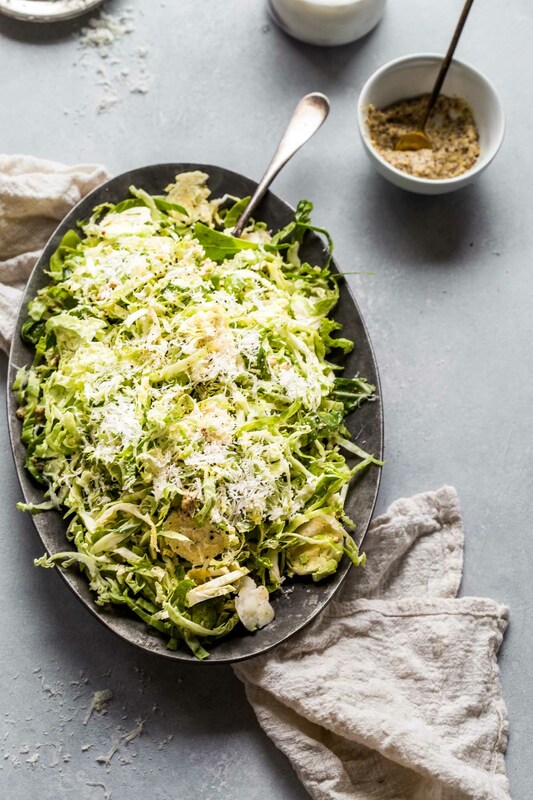 Raw brussels sprouts can seem like a bit of an odd thing – You would never think of serving raw Brussels sprouts on a crudité platter along with some dip. But, much like kale, which can be a bit tough and bitter in its raw state, if the sprouts are sliced thinly enough, and then left to meld with some vinaigrette for a while, they take on a softer, more delicate flavor, but still with a nice bite. This has quickly become one of my favorite salads in my recipe box, rivaled only by this Fennel & Celery Salad and this Arugula Salad. It’s tangy, with a good bite from the mustard, and a bit salty and nutty at the end with the finishing of parmesan cheese. I also love that these shaved brussel sprouts can sit for a bit – Meaning that it’s perfect for potlucks, or for grab and go lunches. The flavors will only continue to combine and the brussels sprouts won’t lose their wonderful texture. Do you have a favorite brussels sprouts recipe that you fix on the regular? Let me know in the comments below! 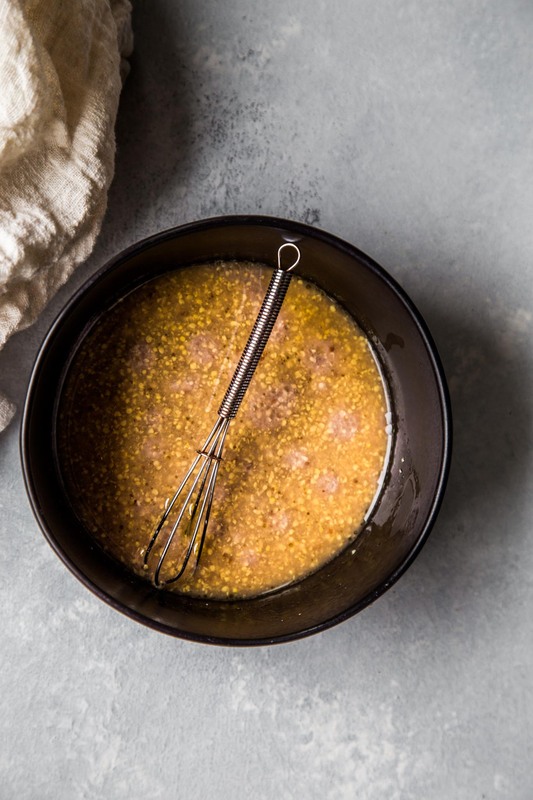 In a medium bowl, whisk together the red wine vinegar, mustard, sugar and olive oil. Season with salt and pepper, to taste. Holding the stem of the Brussels sprouts, thinly slice each one until you get to within ½ inch of the stem. Discard the stems and place the sliced Brussels sprouts in a large bowl, breaking them up with your hands and discarding any tough pieces. Toss the sliced sprouts with the dressing until coated. Let sit at room temperature for at least 15 minutes to allow the sprouts to soften and the flavors to combine. Before serving, toss in the grated parmesan and taste again for seasonings, adding more salt and pepper, if needed. 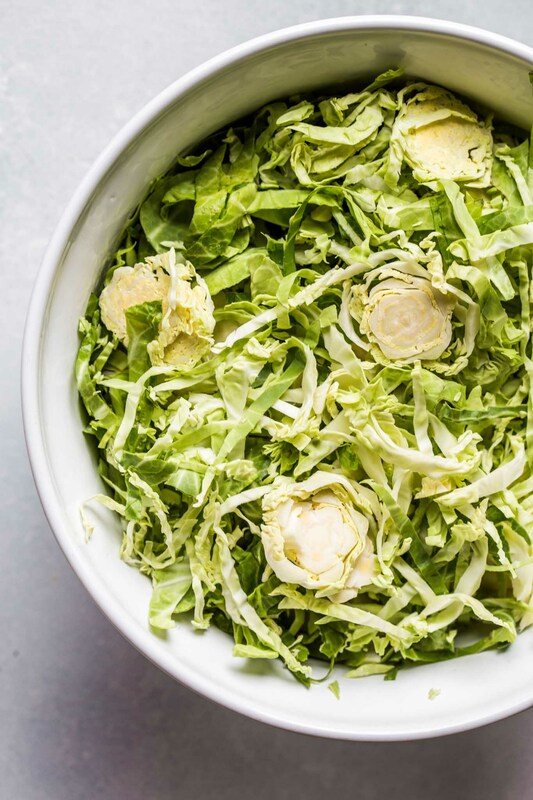 If you loved this Shaved Brussel Sprout Salad I would appreciate it so much if you would give this recipe a star review! Also, be sure to snap a picture of your finished dish and share it with me onInstagram using the hashtag #platingsandpairings and tagging me @platingsandpairings. With its minerality and hints of stone fruit, a Dry Riesling will pop against the mustard vinaigrette on this salad. A light Pinot Noir with bright acidity and earthy notes will compliment the flavors in this salad nicely. That sounds so delicious! We had a shaved brussels salad at Headwaters. I love your simple dressing! Thanks Suzannah! I’m going to need to get in to Headwaters and check theirs out! Never tried a sprouts salad! I feel totally inspired. Thank you! 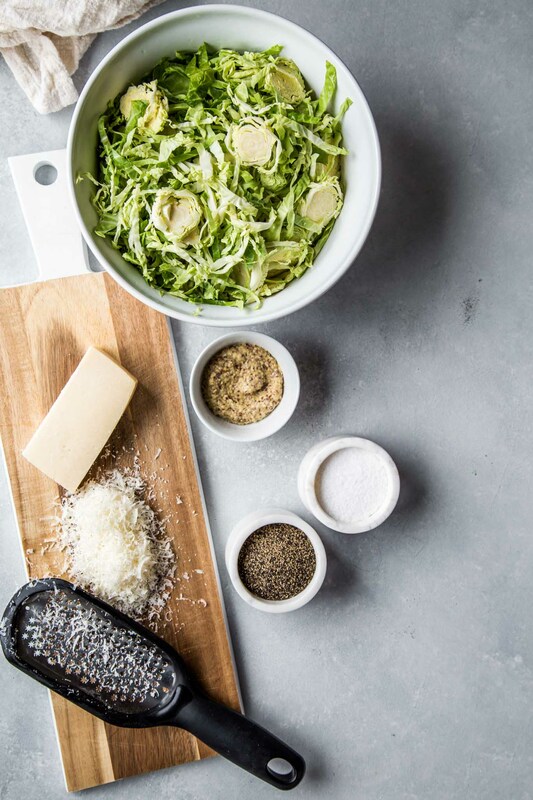 I hope you enjoy Katrin – I really like the texture of the shaved sprouts! This looks so good! Brussels Sprouts are one of my favorite vegetables! I love the lightness of this salad! This will be great for the New Year nutritious eating! I’ve never been a fan of brussel sprouts…at least I though I wasn’t. Recently I had a salad with shaved brussel sprouts and I loved it. And I really like them roasted. Love your recipe and the pics. 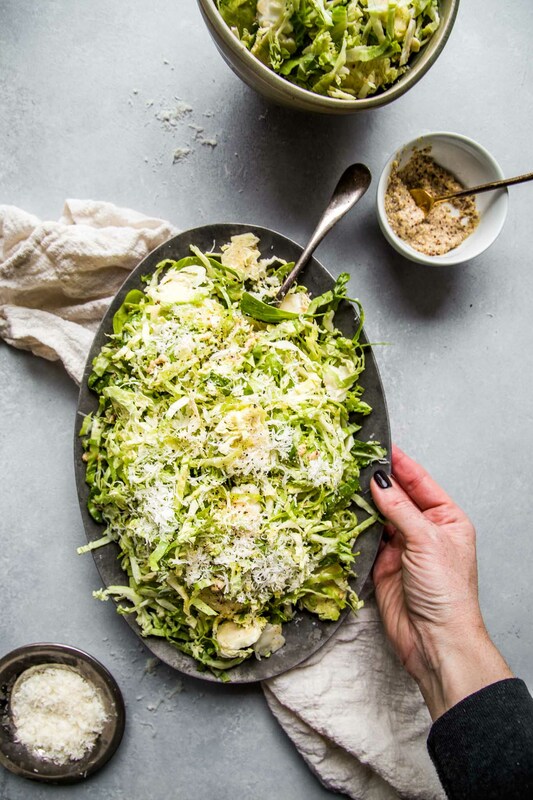 I’m a total Brussels sprout convert too Amanda – They’re now one of my favorite veggies! Yum! I love brussel sprouts and the dressing sounds wonderful! We are huge fans of brussels sprouts around my house – and always looking for new recipes to try! I really love the idea of the mustard with the parmesan … will definitely be giving this one a shot! I hope you enjoy Sara – this is one of my favorite recipes right now! This is about to be on repeat in my house! So yummy! This is my kind of salad – Looks delicious! 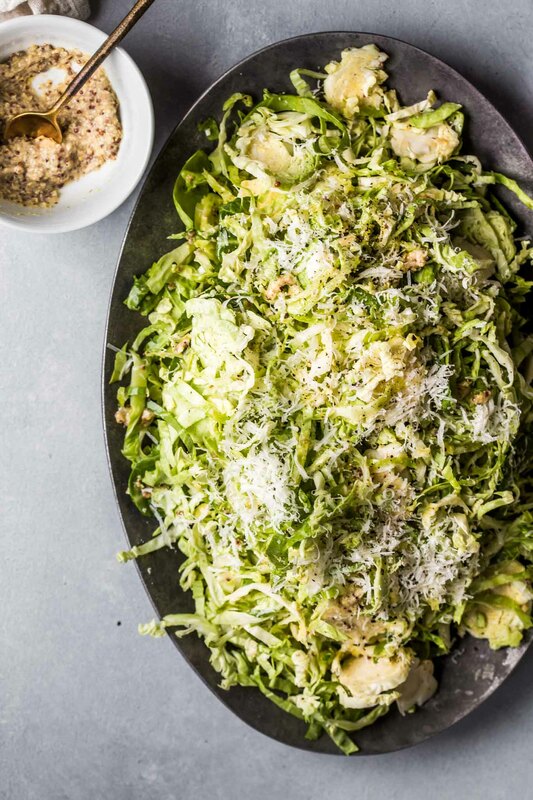 Two of my favorite things in the world are Brussels sprouts and Parmesan cheese! Putting this on the “make soon” list! Yay – I agree Carol! I hope you enjoy. This looks like a delicious salad! Love that you added Dijon Mustard too. One of my favorite ingredients for sure. Thank you for sharing! Of course – Cheers Billy! Can’t folks give a review AFTER actually trying the recipe? It makes the ratings totally deceiving.